Carpeted in a blanket of lush greenery and crisscrossed by a lattice of olive groves, fragrant orange and citrus trees and topped with craggy mountain ranges, our Corfu Villas benefit from all the beauty Corfu has to offer. Dotted with a UNESCO World Heritage Site, encircled by a sparkling blue Mediterranean, caressed by acres of sandy beach and full to bursting with things to do, see, eat, taste and savour, the Emerald Isle is a paradise waiting to be discovered. If you prefer a slower pace of life and want to peel back the layers of civilization to experience a more authentic Greece, the Ionian Isle has a myriad of hidden treasures to soothe the soul and calm the mind. From picture-perfect views at almost every turn to an abundance of Mother Nature’s finest handiwork, Corfu is a place to rest and relax. 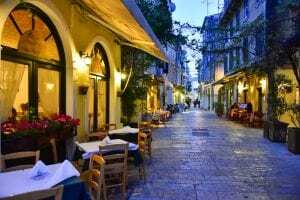 For those who want to savour and sample, the largest of the Greek Islands is a melting pot of flavoursome local produce, sumptuous seafood, talented chefs, top class restaurants and tavernas to wile away the day in. Sun worshippers can soak up the rays at any number of beautiful golden beaches, unspoilt and exotic or full of fun activities for all the family, then return to the privacy in one of our luxury Corfu villas. 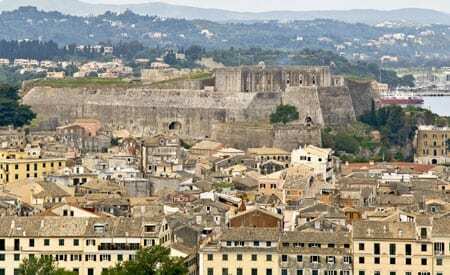 History buffs, shoppers, art enthusiasts, children with restless legs and unrelenting energy couples with an appetite for new experiences; all will find themselves at home in Corfu. 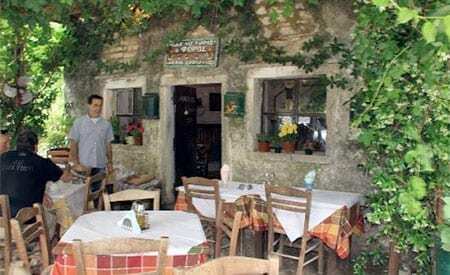 Tucked away in the mountains beyond Kassiopa the crumbling village of Perithia dates back to the 14th Century, steeped in history and enviably rich in natural beauty it is the perfect backdrop to a delicious lunch or dinner. Old Perithia is almost completely abandoned, nudging up to the highest mountain on the island, Pantokrator and filled with historical significance. A designated area of outstanding natural beauty, Old Perithia’s heritage is protected, making for a wonderful excursion back in time. 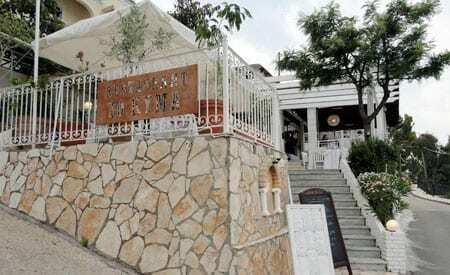 Gelatis Taverna serves up good food and drinks all day until late with a family atmosphere and welcoming ambience. Harry’s Taverna is family owned and run with a menu stuffed full of local food and drink. 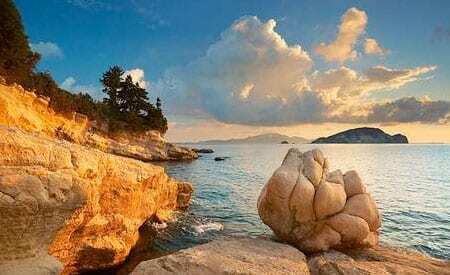 Just five minutes by car from our Corfu villas, Villa Julia and Villa Andrea, you’ll find the picturesque village of Kassiopi is overlooked by castle ruins and bumps up to a beautiful coastline that stretches out to sea and across to the Albanian coast. Our luxury Corfu villas enjoy the idyllic backdrop of all the beauty Corfu has to offer. Kyma: A wonderfully elegant location on the headland is your first indication that you’re in for a meal to remember at Kyma. Overlooking the harbour, the beautiful view is matched by dish after dish of sumptuous fare. With a mix of tourist and local, there is a culinary style to suit most tastes in the vibrant square and harbour from fresh sea food hauled in from the sea just feet away to Italian, Mexican and Chinese restaurants as well as many cafes and bars for drinks and snacks. 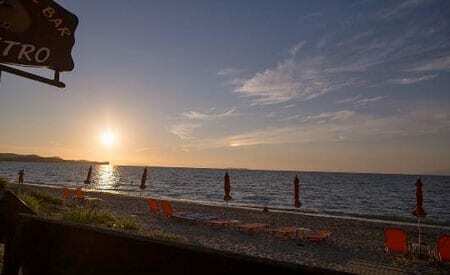 The lively resort of Acharavi is a five minute drive from our Corfu villas. 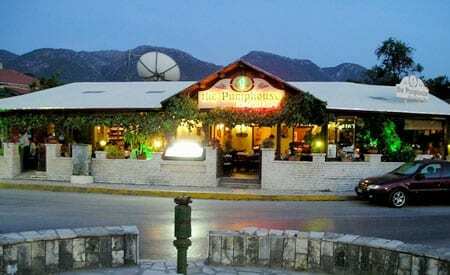 As the main hub for the northern most section of the island, there are bars, tavernas and restaurants aplenty, both modern and traditional, beach side and in town. The Pump House: A wonderful old family run restaurant serving great local food, The Pump House is on many a must visit list with good reason. Odeysseus Taverna: If you’re craving a snack or a cold drink, a stop at Odeysseus Taverna will leave your tastebuds smiling. Snack on local specialities or fill up on delicious mains and deserts. 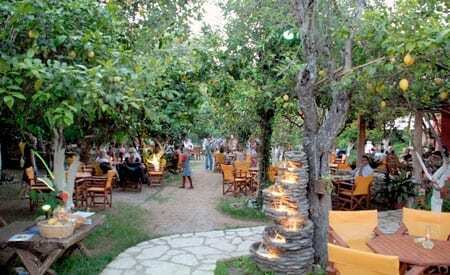 The Lemon Garden: The Lemon Garden serves up good local food in a pretty garden setting, the perfect place to savour the flavours of Corfu. Maistro: If you’re beach-bound and in need of refreshment, the Maistro menu is full of fresh caught sea food and traditional Greek fare. 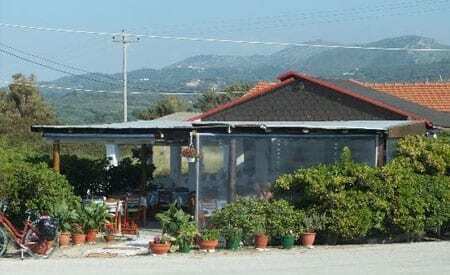 Georges: Competing with one of the best sunsets in Greece can’t be easy but Georges on Almeiros Beach could well pull your attention from the skies with its ultra fresh seafood. 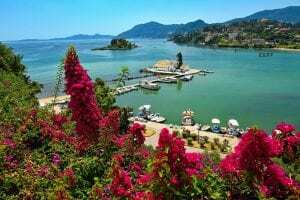 Corfu is blessed with mile after mile of beautiful golden beaches, with some offering a place to just get away from it all to the soothing sounds of waves crashing to the shore, while others offer activities such as scuba diving and windsurfing. Ágios Geórgios Págon: Lying between Cape Arillia and Angelókastro on the northwest shoreline, the beautiful, peaceful Ágios Geórgios Págon is something of a local secret and remains low key even during high season. You can windsurf and scuba in the bay or just float in the clear, clean waters. Longás: Framed by the craggy cliff edges which hug right up to the golden sands, Longás is near to the village of Perouládes and can only be accessed via steps and a steep path from the cliff top. It offers spectacular views out to sea and with no water sports, beach bars or even sun beds it is the epitome of unspoilt. 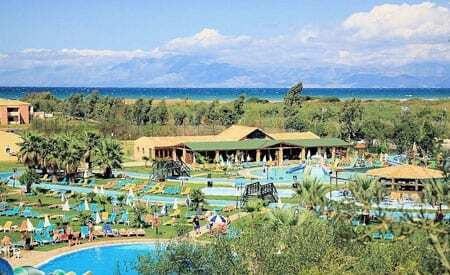 Hydropolis Water Park: If you’re a water baby at heart, the new Hydropolis water park, which is located next to the Gelina Village and Resort is just a short drive away in Acharavi. Set in a landscaped garden, the park is packed with flumes and chutes, giant slides and a number of pools. Great for kids, the park also has plenty for adults with water volleyball and basketball games and a gym. Kérkyra Old Town: A UNESCO World Heritage site, the pretty old town of Kérkyra is well worth a morning or afternoon visit. With beautiful old buildings and picturesque squares, lose yourself in the labyrinth of tiny streets and explore to your heart’s content. 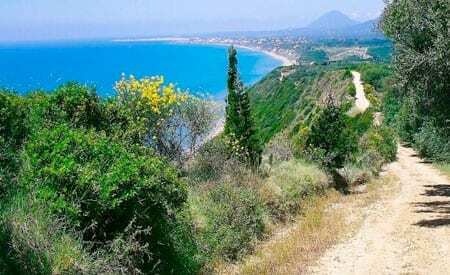 Corfu Trail: The Emerald Isle is home to a riot of nature and you can get up close and personal with it all with a Corfu Trail hike. Although the full route takes several days to complete, it runs from one end of the island to the other which means you can complete a small section without having too venture too far afield. En-route, expect lagoons and mountain summits as well as enough photo opportunities to fill a dozen albums. Sidári: Visit the rock formations just west of the resort to marvel at the cliffs shaped into otherworldly figures by the wind and passage of time. 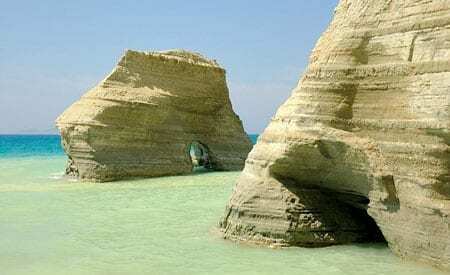 There are several pretty coves near the rock formations to wile away a few hours sunbathing and swimming.